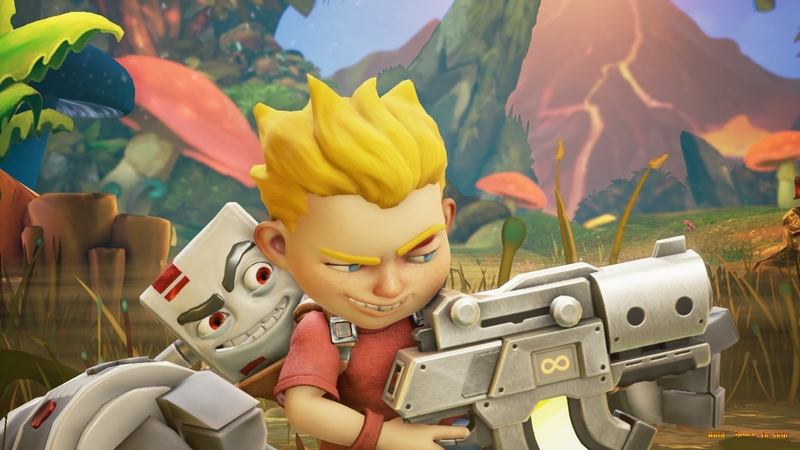 We had the chance to enjoy Rad Rodgers: World One last month and found that it was a well-crafted but flawed affair in its preview state. Rad Rodgers is thrown into the video game world with his rude and crude console Dusty and mayhem ensues. The game pays homage to mid-’90s PC platformers like Commander Keen and Jazz Jackrabbit and uses twin-stick controls better than most platformers out there. The early build we played was a tale of two worlds because the core product was good, but it was missing something. It was also needlessly frustrating due to the lack of in-game direction and fairly steep difficulty curve. Fortunately, the game has undergone several improvements since then and it is a better overall product. The Metal Slug-esque shooting operates the same way as it did then. You can either just shoot forward or use twin-stick controls to get far better angles on your attacks. Enemies will attack you from all sides, but the twin-stick gun aiming allows you to hit them and not have to worry as much about taking damage. The weapon upgrade system is about what you would expect. Finding something on the field allows you to start blasting away, even though it would be nice to be able to switch between the weapons in real-time. This would allow you to use the lower-powered gun against small enemies and then save the newer far more powerful weapon for a swarm of enemies. 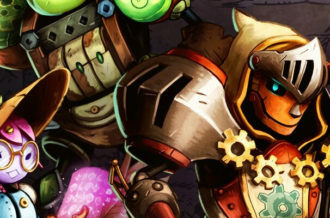 The game’s sense of humor has been revamped a bit — and usually for the better. Rad is still a ’90s kid with a bit too much caffeine and a penchant for needless swearing, while Dusty is foul-mouthed and essentially acts as the devil on your shoulder throughout the entire adventure. The cinematics have been reformatted to now include some title cards to add some visual comedy to the mix, which works very well and gives the humor more than one note to work with. New NPCs have also been added that give you health pickups and other helpful items — which benefits the game as a whole because before, their slightly-hidden areas just led to a line of dialogue and made you wonder just what purpose they served other than to fill space. Now they fill space and make the game easier to enjoy. 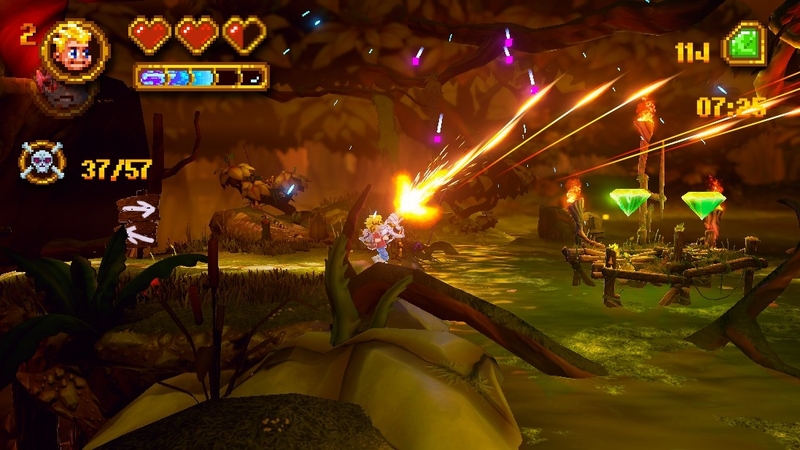 Rad Rodgers’ final build is certainly more user-friendly than its earlier versions. Before, you were sent on a slightly aimless journey. Nothing was explained all that well and areas like the Pixelverse had a clear formula, but didn’t really offer up a challenge. Now, Dusty’s playable sections offer up a fair challenge where he can’t take too much damage or else he’ll be kicked out and Rad himself will lose a heart of health. This makes exploring the small areas something you need to think about — but not struggle with. For the most part, those areas still boil down to finding the right object to punch into the in-game world and thus solving the puzzle and moving on. For those who like a bit of puzzle-solving in a platformer, Rad Rodgers strikes a fine balance between testing your skills, but doing so in a way that usually fits in with skills you’ve learned in the main game. Playing the game to avoid damage and then focus on doling it out is probably your safest bet, as going in with an itchy trigger finger is a great way to get killed. Your default weapon is puny, so you need to think smart and focus on blending in melee attacks with your guns. Generally, wearing down enemies from afar and then smacking them down with Dusty’s giant fists is a solid way to advance. This allows you to clear areas out fairly efficiently as long as you are careful with what you’re doing. If you find yourself struggling, and want an experience that is less-frustrating, then the addition of easy mode is a godsend. Normal is fine and offers up a fair challenge, but for those looking to enjoy this as a more passive experience, the easy mode is the way to go. 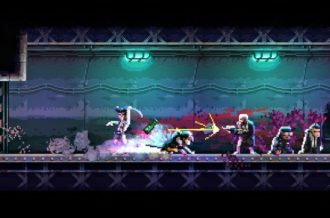 You will get more health pickups, take less damage, and it’s a more forgiving experience. This may seem like it makes things too easy, but given how many things can hurt you and how easy it is to rack up damage quickly, it isn’t. A lot of elements in the world look like they wouldn’t damage you because, just like in the preview build, they aren’t set up as being anything different. A bed of spikes doesn’t just look like a bed of spikes here — it looks like a large red part of the world that you don’t notice is full of spikes until you take damage and then notice “oh yeah, that’s a bunch of spikes!”. 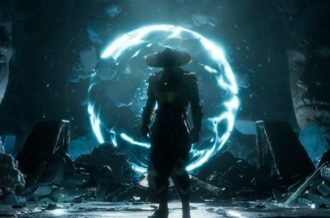 That aspect of the core game design could still use work work because even with incredibly-responsive jumping and shooting controls, the game world is designed to put you in as much peril as possible and attractive nuisances abound because of the lush visuals. Rad and the world are chock-full of detail in some of the richest graphics you’ll ever lay eyes on in a platformer. 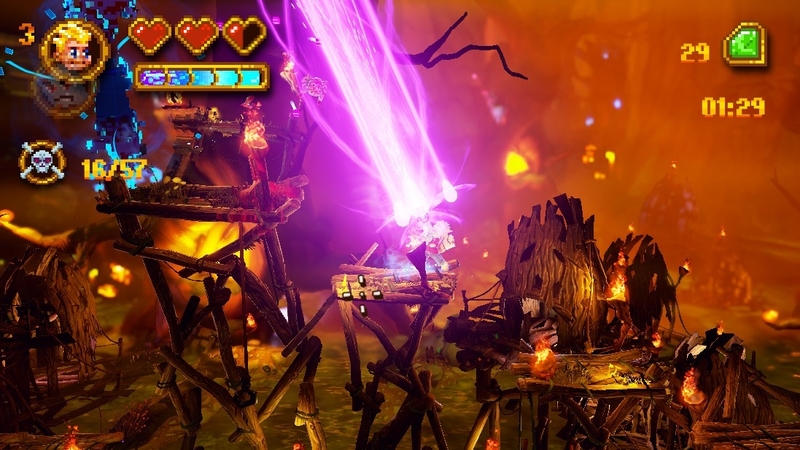 The style reminds us a lot of Giana Sisters: Twisted Dreams, and in many ways, this surpasses in. The sheer level of detail is better and the objects have a much higher fidelity to them and look sharp at all times. It leads to the game seeming almost like a playable CG cartoon — which fits right in line with the game’s story and theme. The game’s sound design is outstanding and one of its best aspects. The voice work is hilarious, with Jon St. John shining as Dusty. He’s a bit of Duke Nukem mixed with an NES that has its carts blown one too many times. He’s jaded, but cares about Rad — so it all kind of balances out. The soundtrack is a surprisingly rock-heavy affair that definitely gets your blood pumping. For a game going for an ironic ’90s XTREME TO THE MAX vibe, it works out really well and the blaster sound effects are outstanding. You can feel the power in the new weaponry just based on how much oomph they’re packing with the sound effect work — which makes getting the new upgrades that much sweeter. 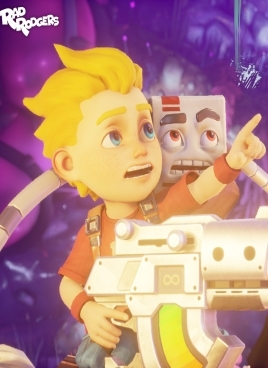 Rad Rodgers: Volume One is a short, but sweet platforming romp. 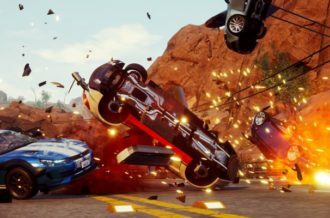 Its high-octane action provides plenty of thrills, while its graphical design manages to both amaze and annoy. Some dangerous parts of the levels blend too well into the regular parts of the world, leading to needless damage. Fortunately, the forgiving difficulty levels make this something that can be worked around to some degree. Rad and Dusty control well and their voice work is fantastic. Anyone who grew up loving action-platformers will find a lot to enjoy here. 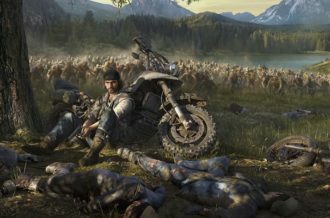 Genre newcomers may be in over their heads, but the game does teach you its core mechanics reasonably well, so it shouldn’t feel too overwhelming.